Routledge’s Modern Grammar series is an innovative reference guide combining traditional and function-focused grammar in a single volume, with an accompanying workbook. 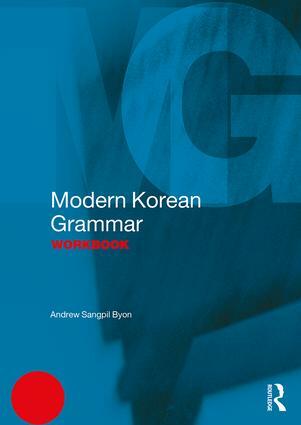 The aim of the Modern Korean Grammar Workbookis to strengthen the reader’s understanding of the main volume, Modern Korean Grammar.. Designed for those who have already acquired the basics of the language, this workbook provides abundant innovative exercises for both essential grammatical features and everyday usage and functions (e.g., giving advices, greetings, requesting, etc.). The Modern Korean Grammar Workbook is an ideal practice tool for Korean-as a foreign/second (KFL) learners. No prior knowledge of grammatical terminology is assumed and it can be used both independently and alongside Modern Korean Grammar. 74. Telling time, date, etc. Andrew Sangpil Byon is Department Chair and Associate Professor of Korean Studies at the University at Albany, USA. As a Korean applied linguist, his primary research areas are sociolinguistics, Korean-as-a-foreign/second language (KFL) pedagogy, and second language acquisition (for American KFL learners).